Simon & Stuart Worthington from Phantom Motor Cars in Crondall were back at Silverstone this weekend, 7th August 2010 and back on winning form. 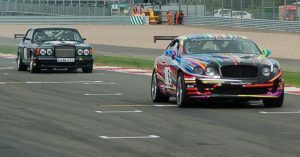 Taking along two cars for this years race, the many times previous winning car, the incredible Bentley Turbo R and also their, latest development, the highly modified and very colourful Bentley GT Coupe. The morning qualifying session went well, with both cars performing outstandingly. For the first race of the afternoon Simon (No 7) qualified in pole in the Bentley Turbo R, with brother Stuart (No 8) gaining 3rd place on the grid in the GT. Over lunchtime the heavy rain arrived, a quick sprint back to the pits and a tyre change for the Turbo R, off with the slick tyres and on with the wets, then off to the start line for the first race of the day! The second race saw Simon racing the GT Coupe in the Bentley Handicap Race, starting from 20th on the Grid and with a 2 minute handicap, again the battle was on to get to the front, with every lap that passed Simon and the GT were ploughing their way through the field with some great overtaking moves in the complex coming in to the start finish straight. The car was on great form and made up an incredible 19 places to come second by just 2 seconds!!! The final race of the afternoon was an All Comers race with a field of 33 cars taking part of all different pedigrees. Again Simon took the GT out for it’s final race of the day and made up an impressive 13 places! Another great weekend for Phantom Motor Cars, with great reviews of both cars and plenty of interest in the new GT.